Konstantin Novoselov, who discovered graphene, and Andrei Sivachenko, who is involved in the mathematical and computer analysis of genetic data, made a list compiled by Thomson Reuters. Two Russian scientists have made it onto the list of the most influential scientists in the world. Konstantin Novoselov, who discovered the material graphene, and Andrei Sivachenko, who is involved in the mathematical and computer analysis of genetic data, are listed as one of 17 world scientists, the newspaper Rossiyskaya Gazeta reports. The list of the most influential scientific minds was compiled by Thomson Reuters, which analyzed the most cited scientific work in articles written by fellow researchers. Vladimir Fortov: What's destroying Russian science? 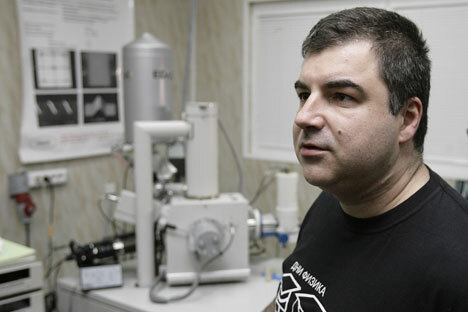 Novoselov won the Nobel Prize for Physics together with his compatriot Andre Geim in 2010 for creating graphene, which the two scientists believe could serve as the basis for nanoelectronics and other advanced technologies in the future. Novoselov, who has 15 publications of global significance, was narrowly beaten by Sivachenko, who has written 17 significant publications, ITAR-TASS reported. Judging by the list, genetic research has had the most influence on the international scientific community. At the top of the rating are several researchers from the Broad Institute, where work is under way on genome sequencing and cancer gene research. The list was headed by the Broad Institute’s Stacey Gabriel, who has published 23 works that are the most widely cited in the scientific press. Thomson Reuters compiled separate ratings of influence for various scientific fields. Five Russian scientists featured on these lists: Rector of the New Economic School and Bulgarian economist Simeon Djankov, molecular physicists Semyon Mikhailenko, Valery Perevalov, and Sergei Tashkun (all three work at the Institute of Atmospheric Optics at the Russian Academy of Sciences in Tomsk), and physicist Sergei Morozov from the Institute for Physics and Power Engineering in Obninsk. Based on material from ITAR-TASS, RG.ru.